Last week the team were at Beckers Annual Meeting of ASCs – widely regarded as the event of the year for executives, administrators, physicians and other stakeholders in the ambulatory surgery market. Against a backdrop of rising deductibles and tightening household budgets the ASC market is booming, with payers triggering a wave of contracting initiatives moving reimbursement out of hospitals and into the more cost-effective ASC environment. New regulations, payment models, and technology mean 2018 could be a year of unprecedented change. However, there’s also growing competition from hospitals wanting a slice of the top end of the market, and at the opposite end, a rise in office-based surgery competing on cost and convenience. Value-based care has stimulated the need to address the patient journey outside of the four walls of the ASC. No real surprise here; being able to track patient progress and intervene after discharge is, of course, absolutely necessary if you are getting paid based on outcomes after 90 days or penalized for readmissions. However, having better visibility of the patient journey makes good business sense even under fee-for-service models. (As an aside, we spoke to many providers who were talking about this despite sticking with traditional reimbursement models for the time being). Optimizing how patients and care teams prepare for surgery, for example, can reduce dreaded late cancellations and improve overall efficiency, as well as lowering risk of complications and improving outcomes. Starting to think about the bigger picture both before and after patients enter your ASC has a dual advantage; it addresses some of your immediate pain points (such as OR utilization), but it also means you have good groundwork in place to make the switch to alternative payment programs easier. In a similar vein, the growing appetite for bundled payments will change the way providers manage end-to-end care. For consumers with high deductibles and the rising number of self-funded companies, the clarity provided by upfront pricing is hugely desirable. Even just a year ago, bundled payments were something nervously whispered about in corridors, now with added incentive from CMS, for many providers it’s a matter of when and how, not if they are implemented. Don Phalen, VP at Regent Surgical Health made an excellent point to this effect, commenting that providers can either jump in and be part of the conversation about what’s included in bundled payments or wait until the market dictates this to them. So, what should you think about before making the transition? To ensure replicable processes at a set cost point, you’ve got to be able to minimize operational and clinical variance in your workflow. In practice, this is a real challenge for many ASCs, particularly in areas of the patient journey such as post-acute care where patient tracking, without the appropriate automation and orchestration platform in place, is notoriously difficult. As CMS approves more procedures for outpatient settings and new technology (particularly interventional radiology) means more minimally invasive procedures, the increase in high acuity surgery continues. Procedures like stenting and de-fib replacement, traditionally reserved for hospitals, can now be done at ASCs, while the demand for spine and total joint replacements continues to rise. Regent, for example, revealed that they have already seen a 300% increase in total joints between 2015 – 2016 and by 2030 they expect their annual total hip and knee joint replacement volumes to quadruple. The addition of high-risk procedures to your repertoire means new operational processes and tighter protocols for pre- and post-surgical monitoring. Gaining real-time feedback on the effectiveness of these new processes, rather than retrospectively sifting through claims data that’s already six months out of date, will help you refine things more rapidly. New technology is emerging to help you do exactly that. As household budgets tighten and high deductible insurance plans are more commonplace, patients are shopping around more for services. Price transparency is also increasingly mandated, with 25 states now requiring costs to be made public upfront, or that ‘good faith’ agreements are in place. In response, more ASCs are publishing both pricing and outcomes data in marketing materials or on their websites in an effort to attract patients. They are also thinking about the patient journey in terms of customer experience tied to very specific processes, not just overall patient satisfaction scores. This is what CMS had in mind with the OAS CAHPS scores – although they’ve hit pause on mandating this, expect to hear more about customer experience as a key benchmark. An unfortunate offshoot of greater price sensitivity has been growing competition from office-based surgery. Although cheaper and more convenient, there are concerns about safety – ASCs need to make sure they can clearly articulate their value proposition around both price and quality. We spoke to many providers who were concerned about revenue leakage or – as they put it – how ‘sticky’ their services are. The main pain point here is high late cancellation rates – which one provider told us can stack up to 40% for certain procedures. Of course, surgery gets canceled for a whole variety of reasons, not all of them preventable, but there’s definitely more providers can do to mitigate this. While employing care navigators can help, what’s really needed is a step back to think about how technology, protocols and care teams fit together. For example, you could use intelligent automation to categorize patients by risk level and match this to a different frequency of call patterns in the run-up to surgery. You could trigger nurse outreach based on digital patient questionnaires that track anxiety, socio-demographic scores, weight loss or medication adherence, or automatically chase missing information from their PCP etc. You could also share regular preparation tips and checklists via digital channels with a nominated friend or family member as well as the patient. The bottom line is that investing in the pre-surgical patient pathway pays off both for patients, care teams and your profit margin. How is 2018 shaping up? 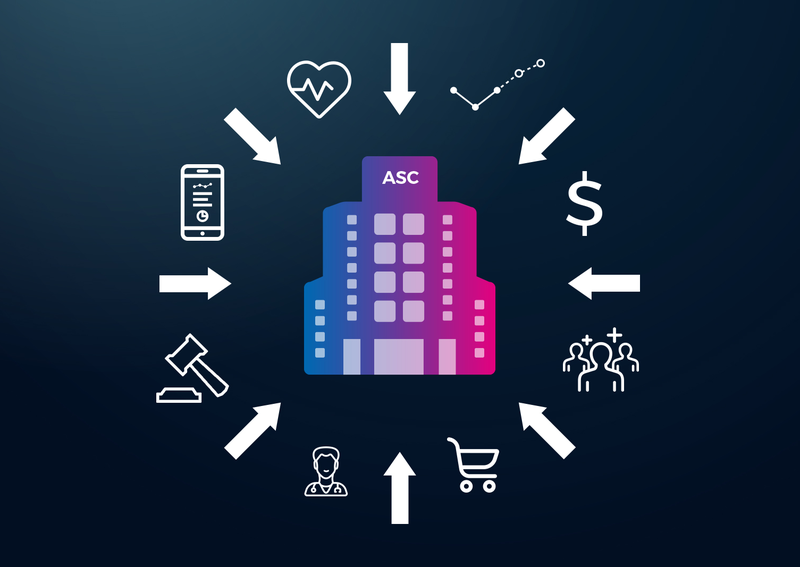 ASCs have a great opportunity to soak up more business from hospitals, but hospitals, of course, won’t give up on this market without a fight. ASCs need to double-down on creating streamlined operational processes across the planned path of care, so they can not only improve efficiency but also the patient and referrer experience. Maintaining the right cadence of interaction with patients throughout the pathway using new and traditional engagement mechanisms builds trust and compliance; two things that are critical as you add more complex procedures to your portfolio. Plus, it’s all essential preparation anyway to avoid any nasty bumps in the road to value-based payment. Interested in finding out more about digital care pathway management solutions for ASCs?